This is a fascinating toothpaste pot, circa 1880. It once contained Toothpaste flavored with Cherry, one of the early varieties of toothpaste used in Britain. Tooth cleaning first become a hygenic standard in 18th century England, primarily for the upper classes, and was accomplished with a variety of strange tools. 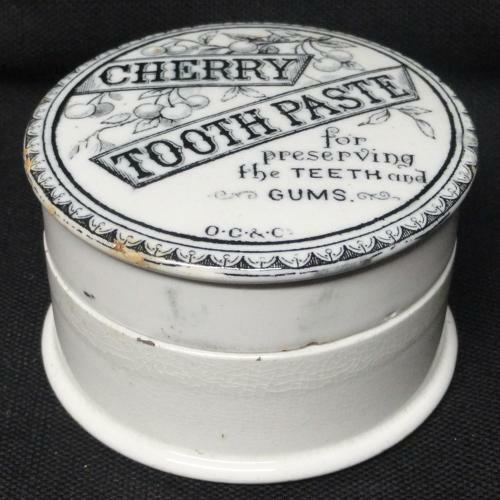 Tooth paste began appearing in the 19th century, and was marketed in these beautiful pots beginning in the 1880s, when nearly every chemist or pharmacist began formulating his own recipe and printing their own pots for advertising. This popular formulation using Cherry extract to make the paste a bit more palatable. Measures 2 3/4 inches wide x 1 5/8 inches tall. The pot lid and base was made in the Staffordshire district and is transfer printed in black with an attractive lid of a wonderful cherry cluster! !